MOONSHOT is One of SLJ’s Best Books of 2015! 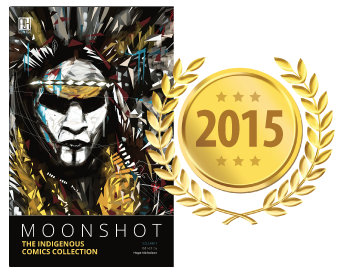 | AH Comics Inc.
MOONSHOT The Indigenous Comics Collection has been named as one of School Library Journal's Best Books of 2015! This publication could not have been made without the support of the thirty+ creators involved, as well as over 1500 Kickstarter backers who helped support the book's production. We are truly honoured by the reception and results this massive project has received, so a huge thank you to everyone! Click here to visit SLJ's website.